Enquirer’s and bookings can be made via email, website, letter or telephone. The Kenton has a bus stop directly in from of the building with routes to Padstow & Newquay all year round. Approx. 10-15 meters from front door. 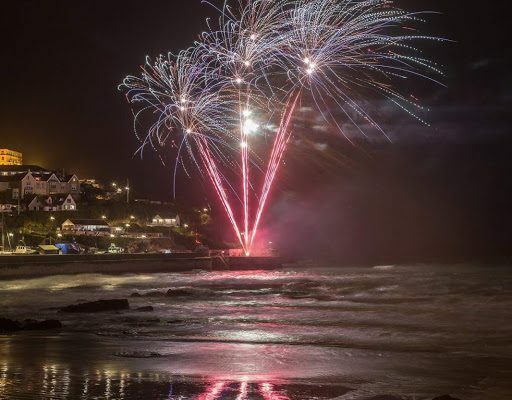 We are just 1.5 miles from Newquay Town centre approx. 5 minute car ride or 30-40 minute walk. Porth village is approx. 1 minute car ride or 5 minute walk where there are a choice of cafe, pub, bistro and two shops. As we live on the premises guests are welcome to have deliveries sent to the guesthouse at any time for us to sign for and look after for them until their arrival/return. Hire of mobility equipment is available from Speedy Hire on Henver Road, Newquay just 0.5 miles away or Tremorvah Industries in Threemilestone, Truro approx. 14 miles away. 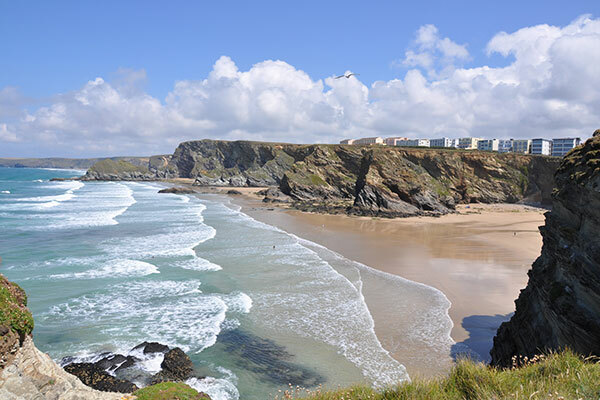 Accessible taxis are available locally in Newquay with prior booking required as with all taxis. Accommodation is available to guests with slight mobility impairment, visual and or hearing impairment. Due to the age and layout of the property it is not suitable for people with severe mobility impairment. For the added safety and comfort of any guests with visual, hearing or slight mobility impairment it is suggested that they may benefit from being accompanied by an able bodied person. We have two private car parking areas onsite, which provide car parking facilities for all accommodation. As there are ample car parking facilities we do not reserve car parking spaces. A member of staff is always available to help guests from the car park if necessary. For guests with mobility problems it is possible to drop off nearer to the entrance with approx. 5 meters walk to front entrance. Drop off is on grass but then onto paved pathway with one step up to the front door and a step over the door threshold. There is no rear entrance to the car park just the front main entrance to and from the building. There are not speed bumps, barriers or speed calming measures in the car park or approach to the building. There is a large print sign in the car park to direct guests to the entrance reception area which has an arrow as well as words, this is not however reflective. There is a front door bell to gain access should for any reason the door be locked, however the door is not locked until 10pm, all guests are given a key to the front door for access after this time. We can have a member of staff available to assist with luggage however can only guarantee this if pre-arranged. The route from the main car park is along the side of the lawned garden and then onto a tarmac path that leads onto the front paved area approx. 20 meters. The route from front parking is along a tarmac path and up 11 concrete steps to front door approx. 5 meters. Security lighting is provided to the rear and street lighting to the front. The rear car park provides a level walkway until the one shallow step and threshold step to gain entrance to the front door. The front car parking area has 11 concrete steps approx. 20cm deep with a tread of 35cm and approx. 1.5meters wide with a central handrail. There is just one main entrance to the building via the front door. As previously mentioned the main entrance can be arrived at via a level pathway from the rear or steps from the front these steps are a wide open concrete stair case with central hand rails and side walls which can be used for support, there are 11 steps each approx. 20cm deep with a tread of 35cm and a width of approx. 1.5 meters. There is assistance provided by a member of staff for entrance and exit of the building by prior arrangement. As we are a small family run building we do not have a loop system installed. Writing facilities are available on arrival by request for guests with speech/language impairment. Entrance is by large double manually sliding glass double glazed doors which are open at all times during the day and only have restricted entrance during night hours front door keys are provided to all guests upon arrival (10pm-7.30am). Lighting in the entrance is largely by natural light but additional above head average lighting is provided for when the natural light is dimming. There are spot lights in the bar area which can be controlled by a dimmer switch to suit the level of lighting required at any given time. We keep a spare key to all rooms in reception which can be available by special request if necessary. There are ample variety of seating provided in both entrance, reception and in fact all public areas of the building. If necessary it is possible for guests to come on a familiarisation tour or escorted visit prior to staying. Upon entrance to the Kenton there is a large flush door mat leading to laminate flooring with ample seating available to rest if necessary. The doors and reception area is open between the hours of 7.30am and 10pm, however we are unable to check guests in after 9pm at night unless pre-arranged. As the Kenton is a small family run business it is modeled on a large family house with no ground floor rooms. Unfortunately there are not currently facilities for severely disabled guests, we do not have any hand rails or grab rails as there is physically nowhere suitable to place them. The reception desk is located under the staircase approx. 90cm high with clear signage and bright lighting with ample seating provided just inside the front door and through towards the centre of the building. There are two small very shallow steps from the front door to the reception area where the level of the building alters slightly due to its age. All signage is provided in large clear lettering, not reflective or in Braille, although if necessary could be provided upon prior notice. The public areas of the Kenton are largely open plan with no corridors or confined spaces very large and open well-lit areas approx. 6 meters at largest point and 2meters at smallest point. As the Kenton is a small building we do not have the facility for lift’s or escalators. All floors are carpeted with the exception of a small dancing area in the bar, sun lounge and partial restaurant which is polished wood and bathroom floors which are vinyl. There are no rugs. We do not have a public phone however guests are welcome to use the main phone by arrangement which is located in the reception area with plenty of seating available. Assistance can be given if necessary. The lighting in corridors is dim too bright with reflective and glow in the dark pictorial and Braille fire signage. All televisions have a teletext and subtitle facility. There are two flights of stairs both carpeted with hand rails and well lit. First flight are 18 steps with manual wired glass windowed fire door at the top 14cm deep, 27cm tread and 1meter wide(13 steps then 1m sq landing and right turn for last 5 steps. Second flight are 16 steps with manual wired glass windowed fire door. At the top 17cm deep, 27cm tread and 90cm wide. The corridors are approx. 1m wide with no restrictions but some turns, all carpeted with well-lit routes. Unfortunately we do not have baby changing facilities. Guests are welcome to bring assistance dogs along with them by prior arrangement, however we request that they are not to be left unattended in the bedrooms at any time, they are welcome in all public rooms with the exception of the dining room due to hygiene regulations so long as they are kept on a lead and under control at all times. There is a large open grassed public area just 50 yards across the road for exercising dogs please do not allow your dog to use the grounds to go to the toilet. All public areas are on the ground floor on one level with the exception of one small step from reception and bar into the sun lounge, there are currently no grab or hand rails. As all rooms have ensuite facilities and the kenton is only open to residents we only have one small unisex WC on the ground floor, which is not adapted for disabled use at present. Lighting in the bar area is controlled by dimmer switches so that the light can be adjusted at any time to suit, lighting in the restaurant is bright with plenty of natural light as well. All areas are very spacious with an open plan feel. There is a variety of seating offered in the bar, lounge and restaurant areas with fixed padded bench style seating 45cm high, plus moveable seating with and without arms all at the same height with some sofa’s too for more comfortable seating. With seating provided for approx. 20-30 people we have more than enough seating for all guests. Tables are also moveable and in ample supply also available in a variety of heights from 45cm to 70cm, some have central support column and some do not. All menus and prices are printed in a clear medium size print; no Braille is available however staffs are always at hand to offer assistance should it be required. We can cater for special dietary requirements with prior notice. The whole building is smoke free with the only smoking permitted outside the building, where ashtrays and a variety of seating are also provided. There is limited outside space with standard wooded picnic benches on a grass lawn area for anyone who may wish to eat their own food or drink outside. There is waitress service in the restaurant but not in the bar area, however staff are happy to serve drinks to table for any guests who may require it. As all bedrooms are upstairs with no lift available we do not have any rooms suitable for wheelchair users. Each bedroom has a fire alarm sounder in it as well as several in the corridors, for any guests with hearing impairment a member of staff is located on each floor and is available 24 hours a day to assist with evacuation and fire alarm awareness. All TV’s have a teletext facility with remote control. All bedroom doors are of standard width with a clear route out of the room. All bedrooms are carpeted some have deeper pile than others. There is a variety of lighting in all bedrooms offering bright and dim lighting. Most beds are divans of standard height with a variety of sizes available from single to 6ft queen size, bunk beds, twins zip and links. There are some wooded bed frames in a couple of the rooms also. As previously stated all rooms are located upstairs with some closer than others to the stairs and public rooms. Due to the style, age and layout of the building there are no lifts available. All signs are available in larger print if required. Entrance to rooms is level with a small low threshold. Staff assistance is always available upon request and non-feather pillows can be provided is required. We do not offer room service as rooms are not equipped for eating in. All rooms have ensuite facilities, all bathrooms are of different sizes and layouts, however a larger bathroom may be requested at the time of booking if necessary. Flooring in most is vinyl floor boarding which is specifically designed for bathrooms and is therefore non-slip, however additional no slip matting is available upon request. Bathroom doors are of standard door width with locks and handles. There are no hand rails in the bathrooms. All but one room have showers with a standard size tray on the floor with just approx. 4-6inches height to step into. There are a variety of shower doors throughout the building along with a variety of shower controls; however staff assistance is available to work any showers. One room has a large double bath which is approx. 60cm high with support handles on the side of the bath. Basins are of standard height with pedestal, no hand rails are provided and there are two taps one for hot and one for cold. Toilets are all of standard height with no hand rails or seat adjusters. There is a small lawned area to the side of the building where people are welcome to take their own blankets or chairs to sit on, with a paved and tarmacked path leading to and from it. In the event of fire staff are available to assist all guest in leaving the building quickly are safely, all rooms are entered and checked by a member of staff on hearing the fire alarm to ensure all guests have left the building. Regular staff training is carried out, all rooms have their own sounder within them and evacuation procedure notices on the back of all bedroom doors in a variety of languages. It is the responsibility of any guest who may require assistance or alternative signage to make this known to a member of staff on arrival. Most mobile networks have full coverage in all parts of the building and grounds. We do not have any interconnecting rooms for carers nor do we offer any discounts at present. Medication can be stored in the fridge in the bar area which is kept locked when the bar is closed, however can be accessed by a member of staff at any time upon request.